Lighting demonstration by Keith Kreuger, IDA Pinal County (Arizona) Chapter Leader, illustrating the difference between a bare bulb and a shielded bulb. No one likes to look at a bare light bulb. The light is harsh and hurts your eyes. 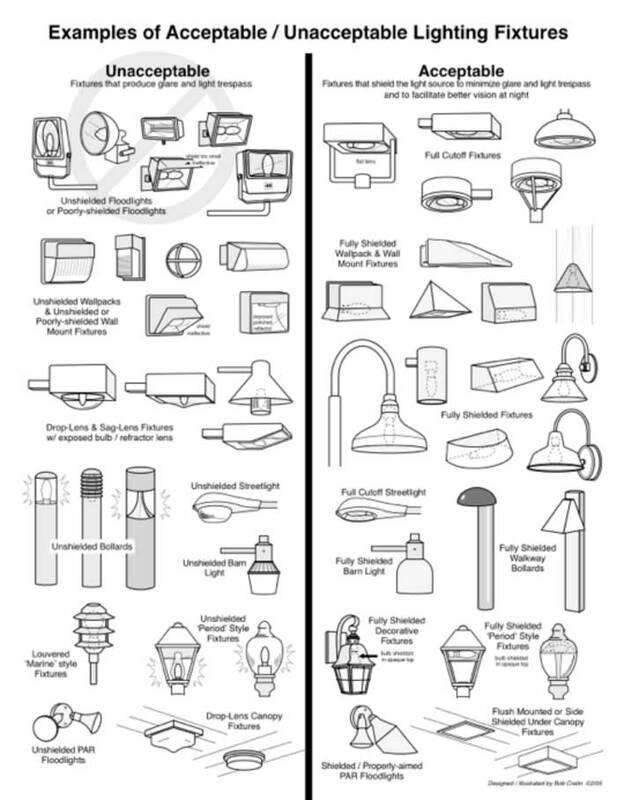 Almost all lights inside homes and offices have lamp shades to cover light bulbs. Although a lamp shade is usually seen as a decorative element, its main purpose is to diffuse or redirect the light from the bulb for maximum effectiveness and protect your eyes from the bulb’s glare. With no shade at all, a bare bulb’s light goes out equally in all directions. So … if you wouldn’t have uncovered bulbs in your home, why would you outside? Outdoor lights do not use lamp shades, instead they use “shields.” A shielded light simply means no light shines above the horizontal, from any part of the fixture. It has a solid barrier (cap) at the top of the fixture where the light is located and a solid barrier around the light where the light source is not visible below the barrier. Shielding is used to block the lamp’s light from traveling upward (causing sky glow and light pollution) or sideways and off your property, possibly blinding your neighbors (known as light trespass). When using a shielded light, the majority of the light is directed downwards and out at an angle, permitting light to flow over a larger area. By ensuring that all your fixtures direct their light onto the ground, instead up in the sky and into neighbors’ yards, you can get the light you need without all the negative repercussions. Not only will shielded light fixtures protect night skies, they will save energy, reduce your electricity bill and lower your carbon footprint! Choosing shielded, dark sky friendly lights improves visibility, safety, and a sense of security, while minimizing energy use, operating costs, and blinding glare. Be part of the solution. Install shielded outdoor lights at your home and office to promote a safe, pleasant nighttime environment so we can all enjoy the splendor of the night sky.